Bookride: Kay Nielsen. East of the Sun and West of the Moon, 1914. 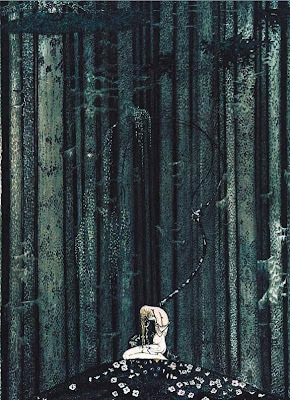 Kay Nielsen. 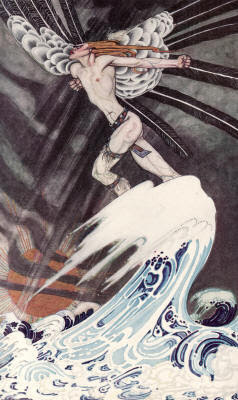 East of the Sun and West of the Moon, 1914. 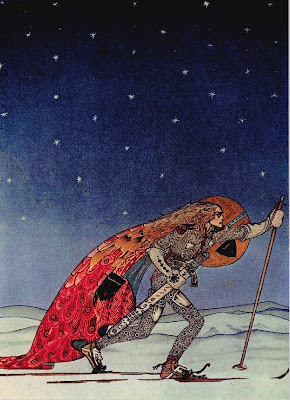 Kay Nielsen. EAST OF THE SUN AND WEST OF THE MOON. Old Tales from the North. Hodder & Stoughton, London 1914. One of the great works from what is now known as 'the golden age of book illustration.' This was from about 1905 to 1930. It is sometimes said that the rising costs of producing these elaborate illustrated books finished them off, certainly by the 1930s there was less money about and these books were always expensive. They started to become expensive again in the 1960s and by the 1970s they were seriously collected. Ancient auction records reveal the venerable Charing Cross bookseller Joseph's paying £4 for a copy of the signed limited edition (500 numbered copies) in October 1950. By 1960 they were paying about £6 - but in 1974 we see them paying £85 for a copy of the ordinary edition. By that time the great promoters of these standard Illustrated books were the fabulous Harrington brothers then selling out of an antique arcade on the King's Road. All early auction results show Joseph's as almost the only buyers of Nielsen (and all the other "Golden Age' illustrators.) Joseph's expert David Brass eventually segued to Heritage in Los Angeles which, for a time, became the epicentre of illustrated book collecting. In the early 1970s I was selling books from a barrow on the Portobello Road and every other punter wanted 'Dulac, Rackham, Nielsen' possibly in the mistaken idea we had never heard of them and would knock them out for a fiver each. Also in the great canon of desired illustrators was Heath Robinson, Charles Robinson, the Detmolds, Jessie M King (my favourite) Willy Pogany, Harry Clarke and bringing up the rear Rene Bull, Warwick Goble and dog man Cecil Aldin. They also wanted 'The Ship that Sailed to Mars' by William Timlin and, from an earlier age, Beardsley and Beerbohm. VALUE? A 'very fine copy' made $27,000 + commission in 2000, in the same year a soiled copy made $13000 with commission. One imagine the silk ties were present in the former copy. Three copies of the limited are currently for sale between $20,000 and $30,000, none fine. Vellum tends to soil or brown with age, so fine copies are things of wonder. The ordinary trade edition (blue) is much prized - it is undated but known to be 1914 and it is hard to find a bright copy for less than £1000. A copy in a modern cloth facsimile binding is a 'Buy it Now' at Ebay at £1450. This kind of binding renewal is unpromising and forces the collector to always have to admit its presence because of its unnatural newness. Nielsen illustrations, presumably broken from his books are said to go for 'hundreds of dollars' - also on Ebay. Outlook? Auction results indicate a slight softening of his prices, Heritage with its meretricious shop on Melrose stuffed with Rackhams is no more, but the vogue for collecting standard Golden Age illustrated books shows no real sign of abating. However some cash rich book collectors, a fickle bunch, may have now moved on to modern first editions, classic literature, fine bindings and photography. Thank you very much for this fine post. I have loved Nielsen's brilliant paintings for children's books since I, er, "liberated" a copy of 'East of the Sun and West of the Moon' as a girl. I've wondered what my trade copy, which I've always loved, might be worth. Thank you for your input on the potential value of my Great Aunt Martha Pierce's copy. I read my East of the Sun and West of the Moon over and over when i was a kid,I loved it.It fell to bits in the end.Was very old. We were given a copy of East of the Sun West of the Moon as children. Written on the inside cover was a dedication to "Mary Barr" from Adelaide Williams. We have always wondered what became of this precious book. This book belonged to us in Missoula MT, 1962. I hope this narrows down the search. Thanks Mrant--these may have some value-- you could try an auctioneer like Bloomsbury. I have a copy of this book. The spine is off, but I have it. Otherwise the book is in excellent condition. All of the prints are in excellent condition. I am interested in finding out the value of this book and might be interested in selling it. Antonio Lopez Garcia...Rare Rizzoli Art Book.